Working for yourself doesn’t pay…or does it? Try telling that to your cousin, who left his decent-paying, stable job with an accounting firm to go into business for himself. He gets up whenever he wants, works in his pajamas, and is seemingly on Facebook all day long. But he’s doing something right – his business is growing and you become envious as he takes cool vacations, buys a gorgeous home, and openly aims for early retirement. Your cousin is in good company. In 2014, 27% of millinneals were self-employed, making it the generation most likely to work for themselves. Millinneals have increased the focus on entrepreneurship, and other generations are taking notice. Books targeted at self-employment are easy to find, as are blogs and podcasts. Self-employment can be rewarding, but it can also be very stressful. You’re dependent upon you (and only you) to attract new clients and get paid. On top of that, you don’t have other financial benefits you might be able to find with a traditional employer. Thinking about making the leap to self-employment? 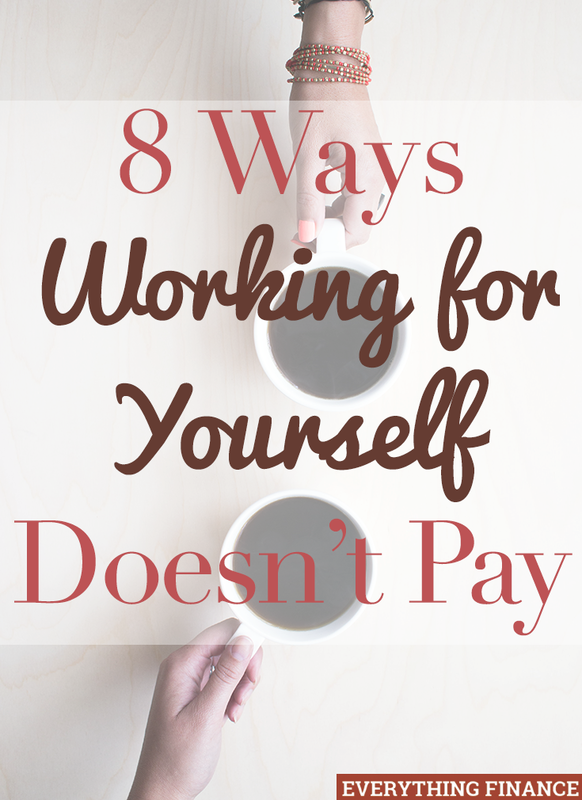 Here are 8 times when working for yourself doesn’t pay. Your cousin is doing well, and he’s being smart with his money so he can retire early. But you aren’t smashing your retirement dreams by staying with your traditional job, as most employers offer some sort of retirement plan. According to a few studies, around 70% of those employers offer matching contributions in some way. The most common matched amount was 50% of the employee’s contribution, up to a capped level. For example, if you contribute 10% to your 401(k), your employer might match 50% of that (which is 5%), but might cap matching contributions at 3%. If you make $50,000 a year and your employer matches 3%, you’ve earned yourself an extra $1,500 toward retirement! When you’re self-employed, it’s up to you to save for retirement. Your cousin might be taking some fabulous vacations, but if he’s being honest, he’s probably having to work a few hours a day before he heads out to the beach. While others are practically doing nothing from Christmas to New Years, he’s probably still putting in as many hours as he can. On the other hand, over three-quarters of American employers offer paid vacation and holiday pay. That means you can turn off your phone, close your computer, and do whatever you feel like for the day (of course, you might “pay for it” when you get back to work and have to wade through emails and catch up on crises). If you are too sick to work or need to run your children to the doctor, you might be able to count on paid sick time. Around 60% of employers offer some sort of paid sick leave. That’s a great benefit to have when you end up so sick you can’t sit up! Your cousin is expecting his first child in a few months, which is awesome news. He’s frantically trying to work ahead so when the baby comes, he can take a few days off to help his wife and cuddle the new baby. He hasn’t shared with you he’s worried his wife will have a C-section and will need additional support, which he can’t manage on top of his business. If you’re self-employed with no employees or business partners, your livelihood could vanish if you’re seriously ill, taking care of an ill family member, or have a baby. That means during a stressful time, with serious financial implications, you have to worry about how to keep your business alive so you can pay your bills. However, if you work for a company with more than 50 employees, Federal law protects you in these instances. Under the Family Medical Leave Act (FMLA), you can take off up to 12 weeks per year for serious medical situations. The employer isn’t legally required to pay you during this time. However, many employers offer a short and long-term disability package that will provide a portion of your income during your time off (usually around 50-67%). Even without the disability pay, you’re at least guaranteed your job if you return within 12 weeks! Medical care isn’t cheap, and insurance costs have risen dramatically in the U.S. over the last few years. In 2014, single employees with health benefits paid an average of approximately $2,500 per year for their health insurance premiums. Meanwhile, on the open market, a single person is paying, on average, over $3,000 per year. While your cousin can probably manage the additional health care premiums, he’s also covering dental, vision, and life insurance premiums – premiums that were paid at his old accounting job. If you’re working for an employer, those employer-paid premiums could save you hundreds of dollars a year. On top of that, if your job requires travel, your employer might offer travel insurance benefits. Working for just about any employer almost certainly means you’ll get discounts. Fast food employees often get discounts on food and retail employees get discounts on store purchases. Retail employees then become a discount advertisement for their employers. In similar fashion, if you’re an employee at a professional firm, your employer might offer discounted (or free) computer applications, such as Microsoft Office, for your home computers. After all, it’s hard to work from home if you aren’t properly set up! The next time you jealously eye your cousin’s vacation photos on Facebook, remember he’s not getting any of these discounts! If you work in a field where continuing education is a must, you might be able to get the required training paid for by your employer – or your employer might offer it for free on-site. If you need to travel for the class, your employer will likely reimburse you for your costs. On top of staying trained for your job, chances are your employer will offer some sort of tuition reimbursement package. Over 50% of employers offer undergraduate tuition reimbursement. If you’re especially lucky, the employer might also allow you time off to attend class or study. There’s extra benefit to this: once you complete your degree, you’ll be eligible for higher-paying positions. Some employers provide a small raise automatically upon the completion of your degree. Some employers reimburse their employees for expenses necessary for performing their job. For example, if you make frequent company-related calls on your personal cell phone, your employer might cover your bill. If you must travel for work, your company will probably reimburse you for mileage, parking fees, and hotel costs. Often, employers will reimburse for meals, which is extra money in your pocket. After all, you were going to eat anyway, whether you were traveling or not! If you travel internationally, check to see if your employer reimburses passport and “trusted traveler” fees. To your cousin, time is money. If he doesn’t have time for clients, then he can’t make any money. He hires out his yardwork so he can focus his attention on his business. It can be difficult to find balance. With the current focus of “work-life balance”, some employers are offering “convenience benefits” in order to increase employee satisfaction and retention. These benefits often don’t cost the employer anything; it’s simply a service the employer brings to the employee. Perhaps your employer offers an on-site daycare. You drive straight to work everyday with Junior in tow, dropping him off downstairs before you head upstairs to your office. The daycare is no less expensive than the other options in town, but you don’t have to extend your commute in order to run to an out-of-the-way daycare. That means more time with Junior at home! Other examples of convenience benefits are periodic massage appointments and dry cleaning pick-up and drop-off at work. One growing trend is the farmer’s market benefit, which is implemented in a couple of ways. The first possibility is the employer offers the farmer’s market on-site during the normal lunch hours. Alternatively, the produce might be packaged CSA-style for pick-up at any time during the workday. Working for yourself can be exciting and rewarding. There’s also no limit to the amount you can earn. However, it can be stressful and the financial rewards are not guaranteed. While others might be having financial success, take a look at what your employer offers and realize your salary isn’t the sum total of your earnings. If you’re unhappy with what your employer offers, it might be time to investigate what the competition offers. Employer benefits might also include catered lunches and concierge services – but those are rare. What great benefits have you heard of employers offering? Do you think it’s worth it to work for yourself, or would you rather take advantage of what employers offer?